A great cutflower due to its very sturdy flower stalk, flower diameter (4" / 10 cm) and wide color assortment that includes several bi-colored varieties. Rich, well-drained soil is important and, while it is quite acceptable to leave the bulbs in the ground, there is a risk of disease. Available in both Fall (plant in moderate climates) and in Spring (plant in colder climates). 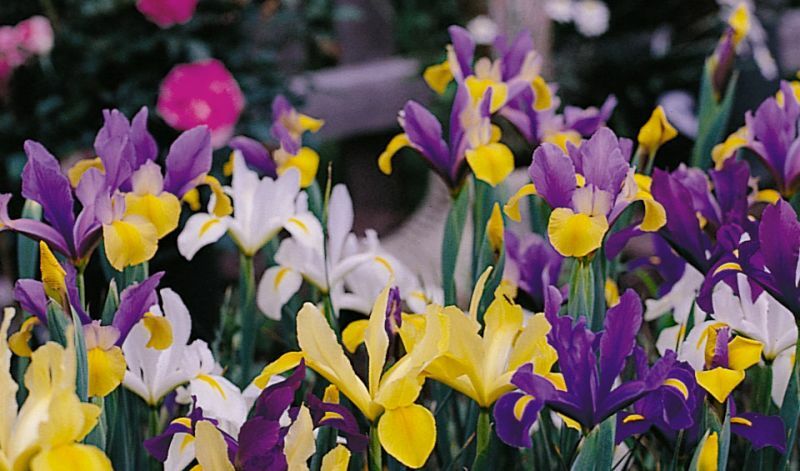 'Apollo' (yellow & white), 'Blue Diamond' (blue), 'Blue Magic' (deep purple-blue), 'Blue Ribbon / Professor Blaauw' (deep blue), 'Bronze Beauty' (mahogany bronze & yellow), 'Carmen' (lavender & white), 'Delft Blue' (blue & white pattern), 'Eye of the Tiger' (rich purple & yellow), 'Golden Beauty' (lemon yellow & orange), 'Imperator' (blue & orange), 'Purple Sensation' (deep purple), 'Royal Yellow' (yellow), 'Sapphire Beauty' (violet, blue & yellow), 'Silvery Beauty' (blue, white & yellow), 'Symphony' (yellow & white) and 'White Wedgewood' (pure white).